1. Heat the blueberries, 1 teaspoon lemon juice, and 1 1/2 tablespoons honey in a small saucepan over medium-high heat until it bubbles, thickens, and gets jammy. Purée if you prefer a smoother texture, or leave a bit chunky, if desired. Divide the blueberry sauce between 8 ice pop molds. Freeze for at least 1 to 3 hours. 2. Meanwhile, dissolve 3/4 cup lemon juice, 1 1/2 cups water, and 3 tablespoons honey in a small saucepan over medium-high heat. Let the mixture cool. 3. When the blueberry layer is firm frozen, pour the lemonade over the blueberry layer. 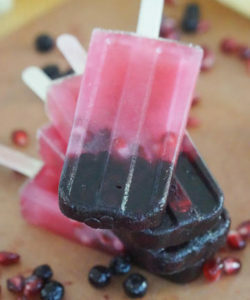 Add 2 teaspoons of pomegranate seeds into each mold. Place a wooden stick in each mold, and freeze everything overnight before enjoying.